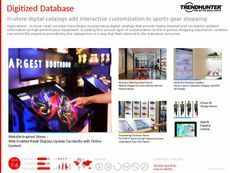 Find Better Ideas, Faster ® with a custom sports tech trend report, our PRO Dashboard and 80+ categories of premium trend reports. 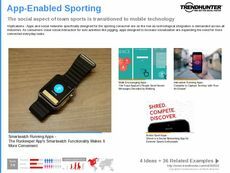 The Sports Tech trend report examines topics like connected sportswear garments, digital wellness trackers and fitness-focused apps that gamify one's workout. Readers will not only learn about products like health sensors but will also be introduced to smart footwear that tracks an athlete's performance and posture habits. 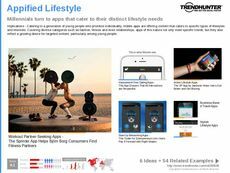 Focusing on the needs of millennial consumers, this report shows readers how technology is used to make casual workouts, training sessions and competitive sports more interactive. 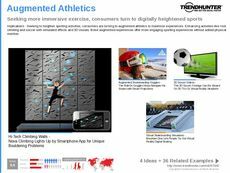 Targeting sport and technology buffs, this report examines connected tech products that monitor athletic performance and endurance. In addition to athletes and tech brands, this report features data that is crucial for app developers with an interest in sport-focused software. The Sports Tech report does not only count down the industry's best fitness wearables but also explores the emerging gamified workout movement. Its data will appeal to fitness industry professionals and athletes who are interested in boosting their physical activity levels.